Doug Lia’s new book “Anna, the Author” is a charming narrative celebrating the joys of reading and writing and the infinite world of inspiration around people. 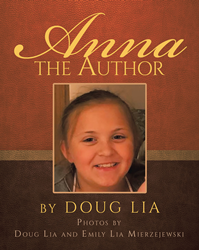 Recent release “Anna, the Author” from Page Publishing author Doug Lia is a sweet story written from the perspective of a little girl who is inspired by her grandfather to write a book about something important to her. Read on to discover what Anna decides to write about! Doug Lia, a devoted father and grandfather and lifelong educator currently serving as an associate professor of elementary education and literacy in Chicago, Illinois, has completed his book “Anna, the Author”: an entertaining short story for young readers. “Anna, the Author” is the story of a young girl whose dream is to become an author someday. Based on her grandfather’s advice to write about things she knows most, Anna thinks of the many things she enjoys writing about. Her surprising discovery is an idea that makes many people happy. This book is a fun read for children and parents to share with their children. It is also a wonderful way for teachers to introduce and encourage writing for their students. Published by New York City-based Page Publishing, Doug Lia’s book is an inspiring tale celebrating the fun and adventure that awaits writers of all ages. Readers who wish to experience this engaging work can purchase “Anna, the Author” at bookstores everywhere, or online at the Apple iTunes store, Amazon, Google Play, or Barnes and Noble.